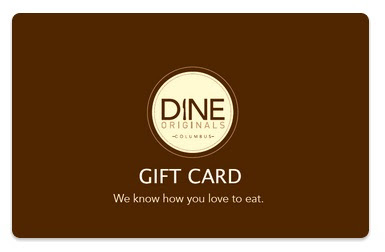 A Dine Originals Group E-Gift Card is instantly available and good at any one of our member restaurants. You can print them, email them as gifts, or redeem them from your mobile phone. They look great, make great gifts, and never expire! Group e-gift cards, available in any denomination up to $100, may be spent at any one of our member restaurants. Purchase your group e-gift card here. Already purchased a group gift card and need to print it out? Click here. *Please note: These certificates are not valid at all member restaurants. A list of participating restaurants can be found here.